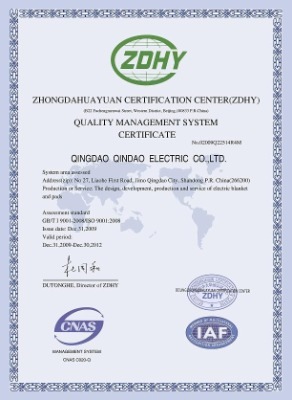 Company Overview - Qingdao Qindao Electric Appliance Co., Ltd.
12YRSQingdao Qindao Electric Appliance Co., Ltd.
Qingdao Qindao Electric Appliance Co., Ltd was established in 1987 (produced electric blanket since 1982). With nearly 30 years history and wide experience, we have been the leader and the 2nd strongest in the industry. Our goal is to be the First-class electric blanket manufacturer in the world.Our technical center which was found in 1993 has been appointed as the Qingdao city technical center. 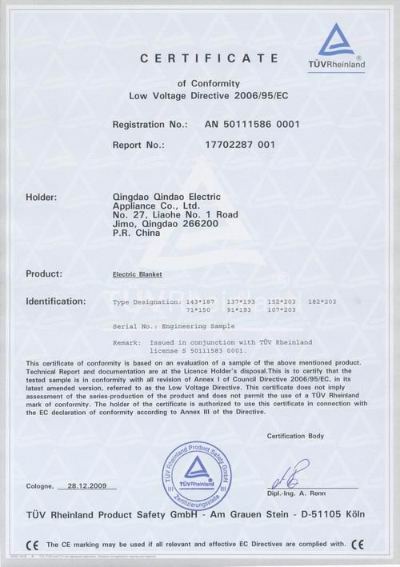 The experimental and testing facilities that we independently researched and developed have been in the leading domestic level and come up to the advanced international standards.As early as 1997, we have passed ISO9001:2000 quality management system certification. 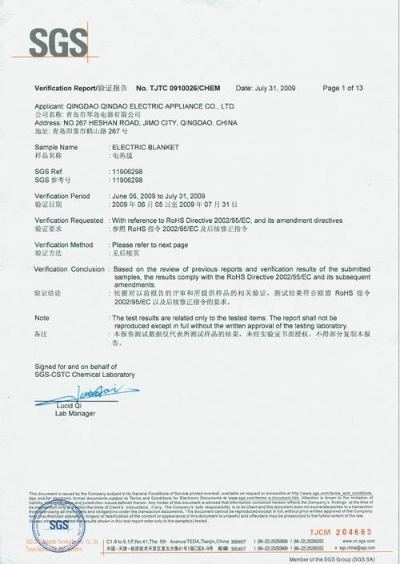 In 2003, the "Qindao" electric blanket won a title of China Top Brand. In 2008, we have been regarded as one of the first national level new and high-tech enterprises. 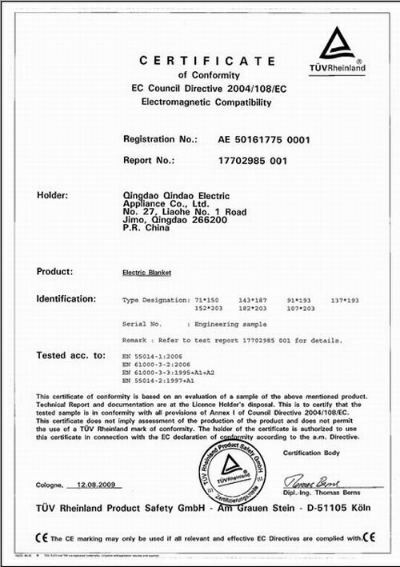 At the beginning of 2009, "Qindao" trademark has been awarded as China Well-known Trademark which is the top award in the industry.We focused on researching and developing new products. During the period 2005-2007, the series of hot spring mud therapy electric products, healthcare electric products and the sea sand electric compress products that our company independently developed have passed the appraisal of the science and technology achievement, the result showed that these new products not only fill in domestic gaps but also reach the advanced international level.In 2008, we have independently researched and developed intelligent controller which has been passed the national appraisal that the products has reached domestic advanced level and the multilayer helix temperature sensing heating-wire has been passed the national appraisal and reached advanced international standards.Currently, there are 28 new products, new technologies of our company have obtained the national patent, and 9 kinds of products have been regarded as the new high-tech products. 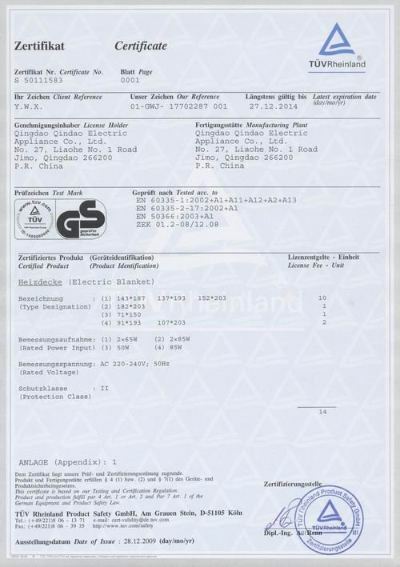 Our products have been passed the international certification such as CE GS RoHS. 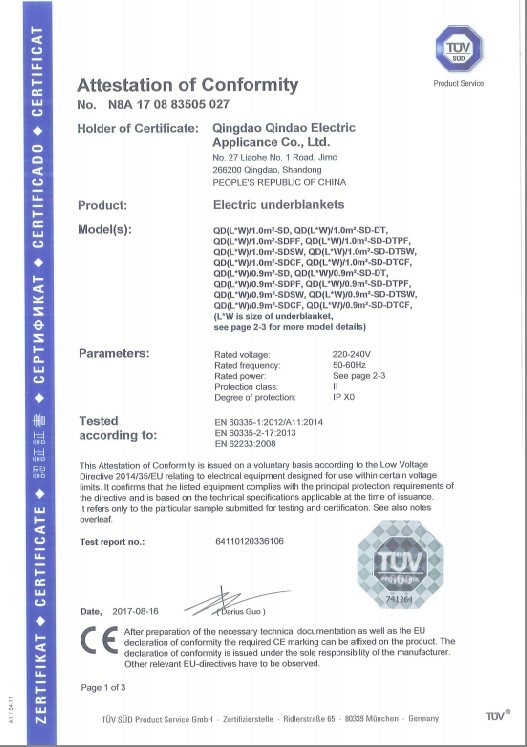 The safe and reliable of our products have been accepted and recognized in the world, we gained good reputation in quality and service from our customers. Now, our products have been exported to many countries such as Australia, New Zealand, Peru, England, Czech, Italy, Switzerland, India,etc. We are also accepted by famous supermarkets like Carrefour, RT-Mart etc.Qindao People have been striving for the goal of "Qindao, warms up thousands of families" and we are proud of serving you.